We all just wanna get lit at the drive-in movie. Smino dropped the video for "Netflix & Dusse" on Wednesday, which, as you can probably imagine, is all about imbibing with your boo and chilling out. 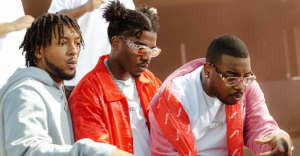 The video takes full advantage of the song's set-up, showing Smino meeting up with a couple different girls at a drive-in movie theater. One girl brings popcorn, another has weed, one of them does his hair, all intercut with Smino and his boys drinking the titular cognac. This August, Smino will be joining SZA on her North American tour, along with Ravyn Lenae. Watch the video for “Netflix & Dusse” above. Re-visit Smino's GEN F profile.